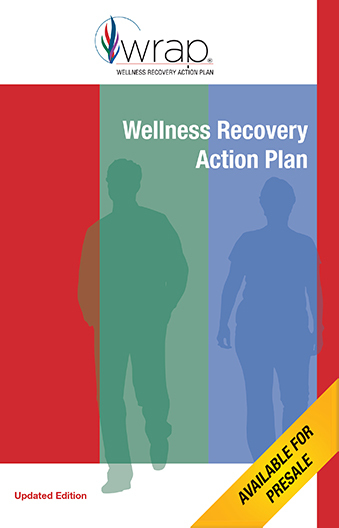 By Darby Penney, MLS, Senior Research Associate, Advocates for Human Potential, Inc.
Wellness Recovery Action Plan, known in the WRAP community as the Red Book, was recently revised, 20 years after it was first published. This involved a challenging balancing act: preserving WRAP’s essential structure, its key recovery concepts, and its values and ethics while adapting the material in response to requests from the WRAP community for various updates. When making these changes, we wanted to remain true to the WRAP basics while adding more information, reflecting current language, and making the text more clear. We added important information to the introduction about what WRAP is and how people can use it to create and maintain wellness in their lives in a variety of situations. We also list some different formats you can use to complete your WRAP, including writing in a journal, notebook, or binder; using the WRAP workbook or the new WRAP app (coming later this summer); or using the Build Your Own WRAP online course (soon to be updated and re-released). We also included an expanded discussion about different ways people can include the power of writing in their use of WRAP. The revised Red Book is now available for presale! The introduction is followed by a new chapter called “Laying the Groundwork,” which explains the five key recovery concepts and discusses WRAP values and ethics. This chapter includes questions and writing prompts to help people consider what they want out of WRAP and how they might wish to apply the values and ethics in their own lives, as well as examples and prompts to help people develop action plans for making the five key recovery concepts part of their daily lives. The wellness toolbox has been enhanced with additional suggestions for tools that have worked for others and new prompts to help people identify the tools they are already using. Other revised sections, such as the chapters on early warning signs and signs that things are breaking down, use examples from the real experiences of people in the WRAP community, as well as prompts that help the user think about what’s best for them. We also included new material to help people think about chances to update their WRAP after a breakdown to better support their wellness moving forward. Many of us who identify as consumers, survivors, or ex-patients have recently been focused on increasing awareness of the meaning and value of peer support, developing trauma-informed approaches, and moving away from using clinical or diagnosis-specific language to describe feelings and behaviors. The Red Book revisions reflect these ideas, resulting in some notable changes in language. The daily maintenance plan is now called the daily plan because it sounds less clinical. During my recent work developing trauma-informed approaches to peer support, I learned that many trauma survivors find the word “triggers” too violent and feel it’s more accurate to talk about “stressors” instead. 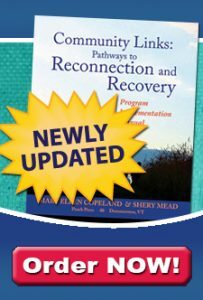 Some sections emphasize the importance of peer support to recovery and wellness, including a new final chapter, “Your Wellness Your Way.” This chapter focuses on using WRAP to create and support a wellness lifestyle, with information on topics including goal-setting, dealing with housing and employment, and taking the next steps in one’s recovery. Though we retired some outdated appendices, we added two thought-provoking new ones. The first, “Using Shared Decision-Making and Decision Support Tools to Support Your Recovery,” describes tools that can help when you’re faced with complex choices. It provides links to decision support tools, such as workbooks, issue briefs, and tip sheets, that were created by people with psychiatric histories. This section also explains shared decision-making, in which an individual invites a provider or supporter to help with their decision-making process but has control over the final decision-making. The other new appendix focuses on the values and practice of peer support across a range of life circumstances and includes a reading list on the topic to help you expand your knowledge of this important approach. There are many other changes an experienced Red Book user may notice as they look through the new edition. For example, there are revised crisis and post-crisis plans with additional prompts for thinking and writing, as well as more flexibility to help people design their plan for any type of crisis—not just a mental health crisis. We understand that sometimes change can be hard, but please know that the core of WRAP has not and will not change. We hope you find the additional material and clarifications helpful to your continued use of WRAP. Darby Penney, MLS, is a senior research associate at AHP. She was a senior writer/reviewer on revisions to the Red Book. Darby is a long-time activist in the movement to protect the human rights of people with psychiatric disabilities. She is the co-author of the book The Lives They Left Behind: Suitcases from a State Hospital Attic.